Must not purchase more ink. 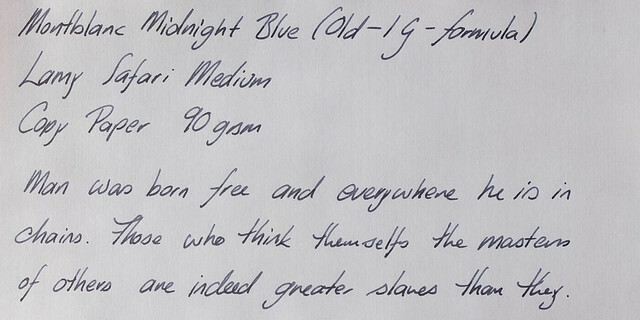 I picked up a bottle of the reformulated Midnight Blue yesterday, below are some photos and some first thoughts. 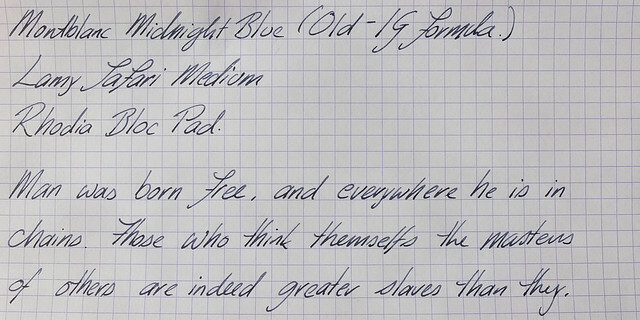 Background: The old formula Midnight Blue has been a much loved 'iron gall' ink, an ink which contains a component that seems to result in fantastic performance, very little bleed and feathering, lots of shading and a degree of water resistance. As the ink reacts with the air it darkens to quite a deep blue black. The problem with iron gall inks is thier reactivity, which can increase corrosion of reactive metals such as steel (i.e. steel nibs), and can cause problems if they dry out in pens. Modern IG inks contain very low concentrations. As a result the cartridge versions (maybe they assume those who exclusively use cartridges are not going to wash out their pens as thoroughly?) of IG inks are often non-IG equivalents. MB is now following Lamy in replacing the bottled IG inks with a non-IG equivalent. 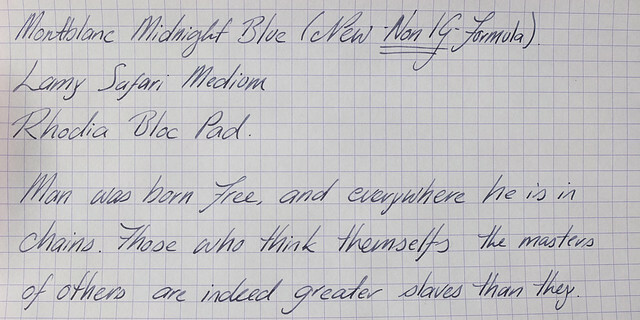 I am not sure if this new ink is identical to the cartridge Midnight Blue, or something new entirely. First, identifying the new ink from the old is quite easy. The boxes are different on one side (the new one does not make any claims about permanency), and the ident numbers on the bottom are different. In addition the new bottles are labled with "BLEU NUIT non perma" whereas the old bottles are labled with "BLEU NUIT". I have tested the inks on Rhodia and copy papers to see if there is a difference between the new and old formulas. My scanner is now older than some forum members, that is to say rather tired. I have taken photos in direct sunlight for comparison. Both inks were in Lamy Safari pens with medium nibs. New formula on the top, old IG formula on the bottom. The new formula performs well on Rhodia, as well as the previous version (no bleed or feathering, and very minimal show through). It does not have the darkness that the old IG formula develops as it reacts and dries. On cheap copy paper the new formula soaks in and looses that depth completely, becoming more of a blue grey. Performance has declined with the removal of IG components, the new formula spreads out a little more on the copy paper and has more show through and bleed than the old formula. The new ink flows quite well, with the same degree of lubrication that the old formula has. The new ink seems to be slightly less water resistant than the previous version, although not by much. The new ink is a pleasing enough colour and performance is not bad, but it's not the same as the old formula ink. 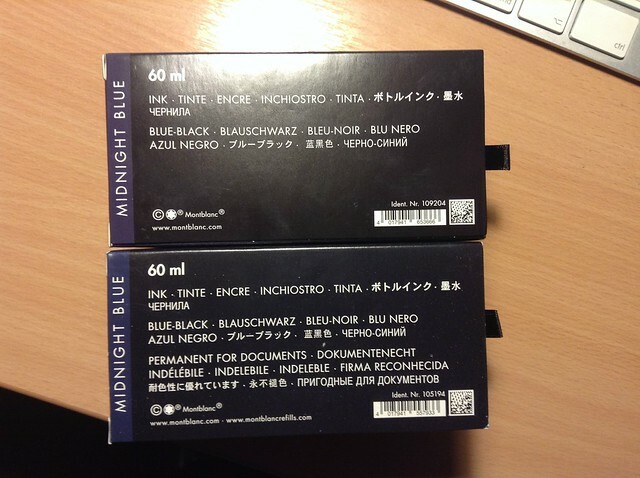 Performance of the new ink seems to be on a par with some of the other MB offerings like Royal Blue. I'll miss the old formula, and when I run out I'll look for another IG replacement. Edited by Bigeddie, 06 October 2013 - 14:20. Thanks for your enlightening review! Finally speculation is made fact. Edited by Ytland, 06 October 2013 - 13:55. There we have it. Right in front of us on paper! A fantastic review! The comparison is quite stark between the two inks. I wonder if the new formula ink gets darker with age? Time will tell. Oh, well, I'll finish the two bottles of the original formula I have left and then cry! that he does not know until he takes up his pen to write. Thank for this contribution as well. This ends all speculation indeed. For me, I like the older formula more. It's darker and more a blue-black than the new one (more a blue-grey at best). I use it sparingly, because I have left just half a bottle. Thank you very much for creating this comparison. Glad I was able to snag a backup bottle of the original. Thank you so much. Based on this, I added a backup bottle of the old version. I am no longer very active on FPN but feel free to message me. Or send me a postal letter! How many hours/days have you soaked the sheet? Thanks for this comparison. I was expecting a much bigger difference in water resistence. Like Cepasaccus, I also have the feeling that a real soak -- i.e. a bath in water for at least 5 min -- would show us something different. Your photos look like you "only" wiped a wet cloth over those lines. No harm meant. I'm glad you've done this before I get mine - due from Wheeler's very soon. I can now plan which pen to put it in and then do my usual. I will read your review properly, before I start scanning. Edited by The Good Captain, 06 October 2013 - 21:57. I let them soak without agitation for about 5 minutes in the dish of water you can see in the first water resistance picture; I didn't time it, but I did go away and do other things. The paper was then pegged up to drip dry for another 15 minutes or so and it looks like there was some more run off based on the bottom edges. I considered going for longer but I thought that 5 minutes of submersion would be the worst case scenario for anything I would write. I was really surprised about the Mystery Black sample at the bottom of the paper. 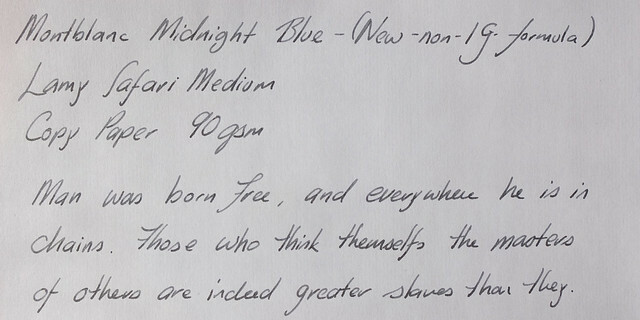 However I haven't washed out the pens yet (I thought I'd keep them filled and use them for a bit for longer duration testing) so I have put another sample if the Midnight Blues and the two permanent inks into soak. I'll fish it out tomorrow and report. The new is a sorry replacement for the old. It's confusing for long time users of iron gall blue black. On the bright side, the permanent blue and black are really water resistant! Thanks! I'll buy that, really!! I usually don't go over 5 min myself (when testing an ink on paper, that is). 5 min is in most cases enough IMO. Lots of inks won't hold up 5 sec. Edited by lapis, 07 October 2013 - 13:08. Thanks for the review! I think I like the old Midnight Blue more. I will try to grab another bottle to use. Many thanks for another wonderful Review! Your efforts support inky enjoyment by allowing me to avoid an unrewarding purchase. I have to give my thanks to you for taking the bullet and confirming my suspicions that a new and unremarkable ink has been produced. I think you summed it up nicely there, there is nothing special about the new ink. I managed to pick up a couple more bottles of the old formula, and I still have 2 bottles of the old Blue-Black to keep me going for the next few years, I'll stock up in Salix in that time for the next decade. This ink game is hard work, you really have to think long term! If anyone is hunting for old bottles try the independents; Old bottle (IG) bottom, new bottle (non-IG) top (at least they didn't do a Lamy and make the boxes the same!). Edited by Bigeddie, 09 October 2013 - 23:41.